Behind the scenes, your Union membership works to support students and staff as they create experiences for a lifetime. It provides students many opportunities to learn, expand their horizons, try something new, and gain hands-on experience in many fields. Our members help support thousands of students across all levels of involvement with the Union, from arts and culture, to the great outdoors. Your Union membership helps support 10, (that’s right 10!) Wisconsin Union Directorate committees. These committees include Alternative Breaks, Art, Cuisine, Distinguished Lecture Series, Film, Global Connections, Music, Performing Arts, Publications, and Society and Politics. All of the WUD (pronounced ‘wood’) Committees give students out-of-classroom learning experiences and amazing opportunities to make a difference, while at the same time making the Madison community a better (and more entertaining) place. Two of the committees are highlighted below, and you can learn more about all of the WUD Committees here. While many of you enjoy the WUD Film Committee’s Terrace After Dark film screenings, did you know that you can also go to one of several student-programmed film festivals on campus? Past festivals have included the Directress Film Festival, the International Film Festival, and the Hyphenated-Americans Film Festival, which showcased Americans with intersecting identities and stories to tell. The festivals are all free, thanks in part to membership support! The WUD Publications Committee gives students real world experience through the creation of eight student-run publications. Students manage every step of the publishing process through their involvement with the Publications Committee. They write, edit, design and publish eight magazines that cover a wide array of subjects– science and technology, music, fashion, political science, food and even travel. They also publish the award-winning literary magazine Illumination, which was recently awarded the 2016 Online Pacemaker Award from Associated Collegiate Press. Your membership helps make it possible and gives hundreds of students valuable, real-world experience in the journalism and publishing fields. Check out this story to read about one alum who is turning her WUD background into career success. Learn more about our publications here. Union membership also supports the six Wisconsin Hoofers clubs, which make outdoor recreation opportunities available to Wisconsin Union members. The Hoofers have an impressive history. As the campus’ largest student organizations on campus, Hoofers offers exhilarating experiences for their members, including skiing, scuba diving, mountaineering, and sailing. 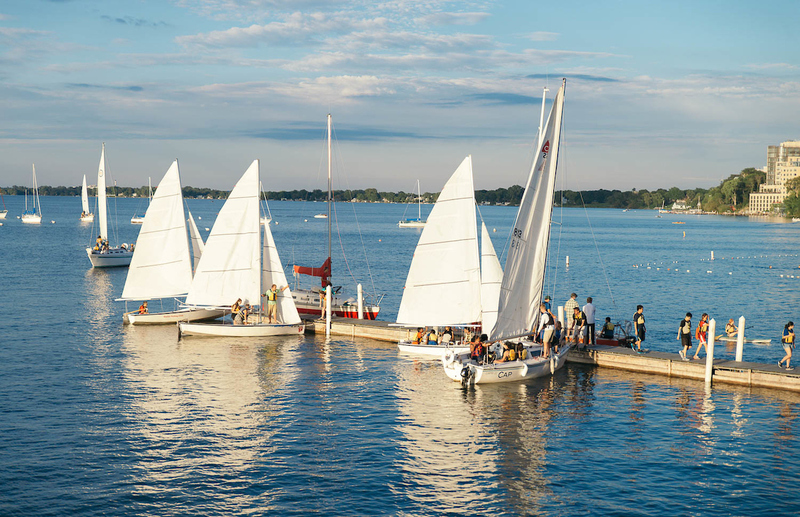 Speaking of sailing, with membership support, the Hoofer Sailing Club is able to proudly maintain one of the largest inland fleet of sailboats in the country. These are just a few examples of the great programs and opportunities that are made possible by membership support. As a self-sufficient organization, we receive no tax dollars. When you purchase a Union membership, you are ensuring that the Union can keep operating as it does, providing students and staff with the opportunities and resources that make the Union the amazing place that it is. And that’s your biggest member benefit of all: contributing to the legacy of the Union. Since its creation in 1928, the Wisconsin Union has been about more than individual members. Instead, it has always been about supporting and educating the students and staff of UW-Madison. Above all, this is what your membership supports. The next time you pull out your membership card to take advantage of an awesome membership perk, remember that you’re backing the students of UW-Madison, and helping maintain the opportunities that we offer. Thank you for your contributions to the Union, and for your support in all of our programming. Your continued loyalty means the Union can keep opening doors for students for generations to come.